Maryland House of Delegates Chris Adams, past President of our Association, is in Annapolis introducing legislation that will be very helpful to our industry if passed. Please click on the attached links to see the actual bills! One of these bills is one to REPEAL the Workplace Fraud Act! Prohibit contractors from submitting existing prevailing wage jobs as survey results for next years prevailing wage survey. Extending the requirement for electronic submission of payroll date to DLLR from 15 to 30 days. Our flooring industry lobbyist will be working with Chris to help get as much passed of this legislation as possible. 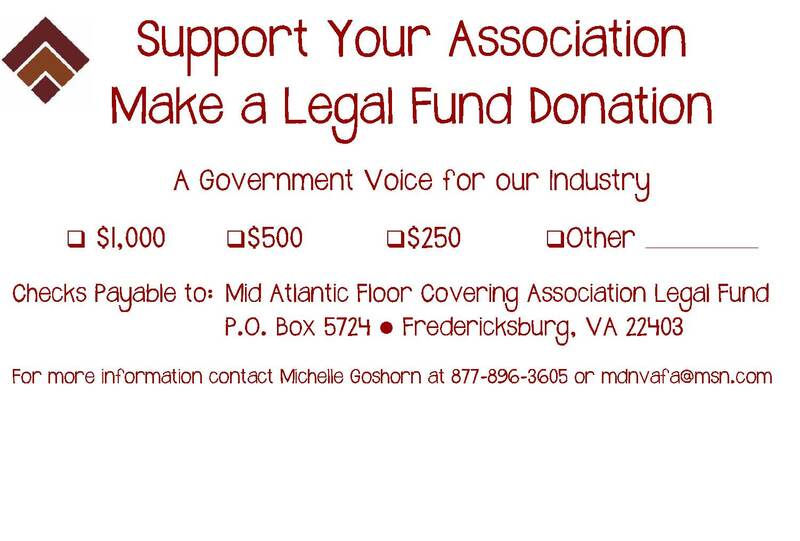 I wanted our membership to be aware of our efforts in Annapolis, and where some of the Legal Fund Association money goes. Should you feel the urge, the Legal Fund is open for contributions at any time to help us continue our efforts! The vote on this bill was entirely on party lines with strong support from the Democrats and strong opposition from the Republicans. Some of the strongest supporters of the Floor Covering Association, including Senator Allan Kittleman (R – Howard Co.), Senator David Brinkley (R – Carroll & Frederick Co.), Senator Jim Mathias (R- Somerset, Wicomico, & Worchester), Delegate Warren Miller (R- Howard Co.), Delegate Susan Krebs (R- Carroll Co.), Delegate Justin Ready (R – Carroll Co.), Delegate Kelly Schulz (R- Frederick Co.), and others opposed this bill. Another bill of significance that was passed this session is the Prevailing Wage – Applicability (HB 727/ SB 232). As with the Minimum Wage Act of 2014, this bill was significantly amended before it was passed. If it had passed as it was originally written, it would have eliminated the State funding thresholds entirely on school construction projects and would have made any school construction project that used even $1 of State funding, a prevailing wage project. As amended, the Prevailing Wage – Applicability bill provides that a “public body” for purposes of the prevailing wage laws, includes the construction of an elementary or secondary school for which 25% or more of the money used for construction is State money. Previously, the threshold was 50% so this does represent a compromise over the original language of the bill. As with the minimum wage bill, the vote on the Prevailing Wage – Applicability bill was also divided on party lines with Democrats voting in favor, and Republicans opposing. In addition to the bills that passed this session, equally important, if not more so, were some of the bills that did not pass this session. Several other bills, that had the potential to greatly impact the members of the Floor Covering Association were strongly opposed and never made it out of committee this session. Among these bills was the Maryland Earned Sick and Safe Leave Act (HB 968/SB 753). Under this bill, employers with more than 9 employees would have been required to provide their full-time and part-time employees with up to 56 hours of paid sick and “safe” leave based on the number of hours worked. This bill was previously introduced in 2013, without the exception for businesses with fewer than 10 employees and was unsuccessful. Even with the exception for small businesses this year, this bill received strong opposition from the business community, including our Association. As with the previously mentioned bills, support in the House Economics Matter Committee and the Senate Finance Committee was divided again on party lines. Along with the increase in the minimum wage, a mandate to provide employees with paid time off would have extremely costly for many small businesses in Maryland. One of the most significant bills for our commercial members which, fortunately also did not make it out of committee, was the Prevailing Wage Rates Reform Act of 2014. Under this bill, the prevailing wage laws would have been expanded to include private development on land owned or leased by the State or a political subdivision, it would have eliminated the 50% State funding threshold required for a project to be subject to the prevailing wage laws, and it would have eliminated the annual prevailing wage survey thus establishing the labor union’s collectively bargained wage rates as the prevailing wage rate for all construction trades throughout the state. As if the prevailing wage rates are not already nearly synonymous with the union rate, this would have been disastrous for the construction industry as a whole, which is more than 87% NON-union in Maryland, but specifically for the flooring industry, which is nearly 100% NON-union in Maryland. While the current prevailing wage rates are unrealistic and the manner by which they are determined is indeed faulty because of the lack of real data being collected by the State, eliminating all wage rate data collection is not the solution to the problem. There was strong opposition to this bill not only from the Floor Covering Association, but also from other organizations representing merit shop employers. Support in the legislature was also sharply divided along party lines with strong opposition from our supporters on the Republican side of the aisle in both the House Economic Matters Committee and the Senate Finance Committee. 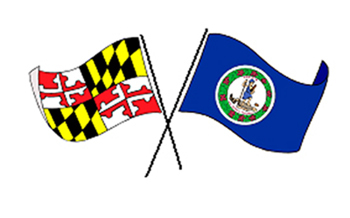 The Maryland Northern Virginia Floor Covering Association will continue to support legislation that favors businesses in Maryland and will continue to strongly oppose any legislation that would endanger the ability of the members of the Association to continue operating in Maryland. Given the current political climate not only in Maryland, but throughout the U.S. and the legislative trends of the past few years, there is no doubt that more anti-business legislation will be proposed and unfortunately, some will pass in the coming year and beyond. However, we do not intend to sit passively by and let anyone undermine our members’ businesses without a fight. The Association will also continue to work closely with our lobbyist, Mr. Bruce Bereano, as well as with a number of key legislators to establish strong working relationships with legislators throughout the State. These relationships with legislators who understand business and support legislation that favors the continued success of businesses in Maryland, are critical to our success as an organization and to the success of each and every one of our members. From time to time, questions arise concerning various Maryland Home Improvement Commission (MHIC) licensing rules and regulations. Recently, a question was raised regarding whether or not an MHIC license is required to install laminate flooring in a residential dwelling. We would like to take this opportunity to clear up some of the confusion surrounding the MHIC licensing requirements. What is a “home improvement?” Under the Maryland Code, a “home improvement” is defined as “the addition to or alteration, conversion, improvement, modernization, remodeling, repair, or replacement of a building or part of a building that is used or designed to be used as a residence or dwelling place or a structure adjacent to that building; or an improvement to land adjacent to the building.” A home improvement includes work that is done in an occupied residential dwelling including single family homes, individual condominium units or multi-family dwellings with fewer than four individual units. It does not include the construction of new homes, work done in apartment buildings with four or more units, or work done in the common areas of condominiums. Although neither the Maryland Code nor the Regulations address specific flooring products, the Maryland Home Improvement Commission has previously concluded that the installation of carpet does not meet the definition of a “home improvement.” Accordingly, no license is required to install carpet. However, at the present time, there is no exception for any other type of flooring product. According to attorneys Susan Cherry of the Maryland Attorney General’s Office and Joel Jacobson, who is Counsel to the Maryland Home Improvement Commission, the Commission has previously considered whether the installation of “floating” floors such as laminate flooring falls under the definition of a “home improvement.” The Commission has concluded that the installation of laminate and other floating flooring products does, in fact constitute a “home improvement” for which an MHIC license is required. Consequently, anyone who installs laminate or any other type of floating flooring that is installed in a similar manner MUST have an MHIC license even though the product is not permanently adhered to the dwelling in any way. Who is required to obtain an MHIC license? Any person who acts as a contractor or a subcontractor who performs home improvement services, or a salesperson who sells a home improvement in the State is required to obtain a license from the MHIC. If you hold an MHIC contractor’s license, and you have employee installers who perform home improvement services (in other words, who install any flooring product other than carpet), your employees are covered under your contractor’s license. On the other hand, if you engage a subcontractor to perform home improvement services under the terms of your contract with a homeowner, the subcontractor must hold an MHIC contractor or subcontractor license of his or her own. A person who holds an MHIC subcontractor license may not contract directly with a homeowner and can only work under a licensed contractor. It is illegal for any unlicensed contractor or unlicensed subcontractor to perform home improvement services. There are both civil and criminal penalties including fines up to $5,000 and up to 6 months in jail for performing home improvement services without a license or allowing an unlicensed contractor or subcontractor to perform services on your behalf. With regard to salespersons, anyone who solicits the sale of a home improvement, negotiates the sale of a home improvement, or signs a sales contract on behalf of a licensed contractor must have an MHIC salesperson license. Accordingly, every salesperson employed in a retail flooring establishment that sells and installs a variety of flooring products must be licensed (including salespersons employed in big box stores). This is particularly important if the salesperson travels to the homeowner’s home to perform any sales services, to negotiate the terms of the sales agreement, or to sign the sales contract. There are two reasons for this. One, only a licensed contractor or licensed salesperson employed by a licensed contractor may sign a home improvement contract. And two, the licensing process is intended to provide the homeowner with a degree of protection by requiring the salesperson to provide information on the license application regarding any criminal convictions that the salesperson may have. A person who travels to the homeowner’s home to simply perform a measure and does not engage in any sales services is not required to be licensed. Advertising by Licensed Home Improvement Contractors All advertising by licensed contractors or subcontractors must include the contractor or subcontractor’s MHIC license number in the format “Maryland Home Improvement Commission License No. : XXXX” or “MHIC License No. : XXXX.” Licensed contractors and subcontractors must also display their MHIC license number of both sides of any vehicle primarily used either by the licensed contractor/subcontractor or under the licensed contractor/subcontractor’s direction and control for the performance of home improvement work. The number should be displayed in the format “MHIC #: XXXX” and the display must be at least 3 inches in height. Contract Requirements If you have not updated your sales contract documents recently, you may want to review your documents. New regulations have changed the form and content that is required in home improvement contracts. The “Notice to Home Improvement Contractors” provided by the MHIC and available on their website at https://www.dllr.state.md.us/license/mhic/mhiccontracts.shtml provides additional information about contract requirements.